Whitening De Pigmentor Cream is the correcting 24-hour skin care that helps fade hyperpigmentation and brightens the complexion for an even appearance. Whitening De Pigmentor Cream is the correcting 24-hour skin care that helps fade hyperpigmentation and brightens the complexion for an even appearance. Depigmentation Complex inhibits the formation of melanin and stimulates skin renewal. This increases the breakdown of pigmented cells. For an even complexion. Apply to cleansed skin treated with Whitening De Pigmentor Serum morning and evening during months with little sunlight. 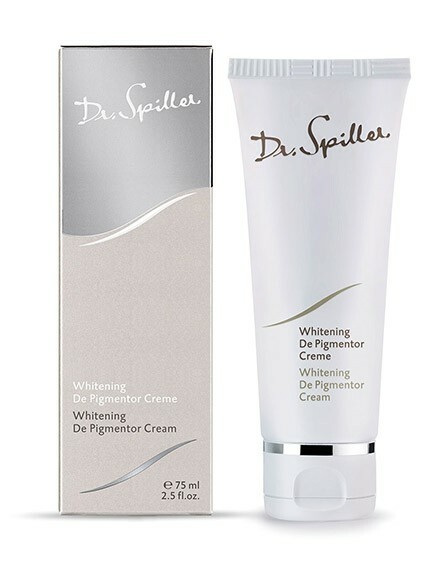 Requires one of the Dr. Spiller sunscreen products with a high SPF even under low-sunlight conditions because the skin becomes more sensitive during treatment with whitening products. The skin care results can be maintained by avoiding sunbathing and protecting the skin with a high SPF during the sunnier months.